Come and join us for NETWORKING ON THE RANGE, the Driving Range that is. You do not need to be a golfer in order to participate -- All skill levels welcome! This event is a great opportunity for both those that have never set foot on a golf course before to learn a new skill and the seasoned player to tune up their swing. 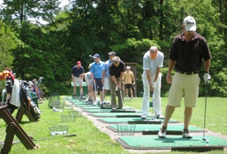 Enjoy 45 Minutes on Farmington Woods Golf Club Driving Range. Clubs will be available or you may bring your own. A Golf Pro will be on-hand to show the beginners proper swing technique and to assist those more experienced in improving their driving skills. Following, we will head to the Clubhouse for a complementary appetizer, cash bar, and networking. So come, take a break from work, get a little fresh air, and enjoy a fun-filled evening at a beautiful private club getting to know other area young professionals. It may be just the event you have been looking 'fore'. Attend 4 Consecutive Monthly V.Y.B.E. Events and the 5th one is FREE! is the Avon Chamber's networking group for young professionals ages 21 to 39 who live and/or work in the Farmington Valley and surrounding area. This group is all about Creating Community | Expanding Your Network, and | Increasing Your Skills.